There is one suggested memory verse that coordinates with the character trait being studied each week. These are located on the back of the Character Trait Tune Charts (below) as well as on the Scope and Sequence Sheets. However, there are several choices when determining what your child should memorize. Maybe you wish for all members in your home to memorize one verse or passage of Scripture together. Or, your child may have a required verse to learn for his/her Sunday School class, AWANA, or Pioneers program. Please choose what you feel would be best for your child and your family's circumstance. As Christians, we desire to exhibit traits that reflect Christ. We can train and instruct our children in these traits, but without the indwelling of the Holy Spirit, they will be powerless. As you teach the character traits, pray that God will help your children understand that they are sinful and in need of a Savior, that He would stir in your children a desire to live for the glory of God, that they would accept Jesus as their own Savior, and invite the working of the Holy Spirit. Children need God, not just good morals and character traits to follow! Use Bible stories to point them to God. The stories in the Bible, the characters, the events - - ALL point to God. So, in addition to studying the character traits exhibited by the people of the Bible, also make sure to take time to think about and discuss what the stories reveal about the character of our Lord. Children will learn that He is all knowing, all powerful, faithful, loving, gracious, attentive, eternal, and much more! The Joyful Heart Character Trait Tune Charts are listed below and are meant to be printed double sided. The front side of each chart contains the name of the character trait being focused on, a related visual cue, and words to the song. The back side contains a definition of the character trait, a possible Bible memory verse related to the trait, related Bible verses to read and study, and lists one or more related Bible characters or stories from the Bible that could be read during the week. I would suggest printing each tune chart, placing each one in a page protector, and binding them in a three ring notebook binder. Related fictional stories and a craft or activity can be seen on the scope and sequence sheets and lesson plans to correspond to each character trait as well. are set to the familiar tune of 'If You're Happy and You Know It'. As an alternative, if you are looking for a single sided chart that contains just the character trait definition and the related Bible verse, the following charts are for you! The Character Trait Definition and Verse Charts focus on the same character traits as above, but do not contain the character trait song. Per a visitor's request, there are now printable 'coins' with the picture and title of each character trait. These correspond with the above Character Trait Charts. You may wish to use the 'coins' in a lap book as you study each one or as incentive tokens to give out to your kids as you see them displaying those traits. 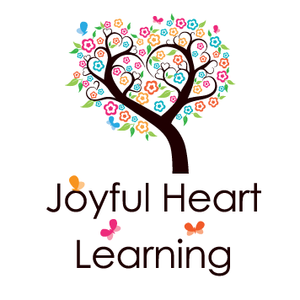 For literacy, in the Joyful Heart Character curriculum, your child will be working on phonemic awareness skills, phonics work, writing, and emergent reading. Some of the skills are explained in the lesson plan sheets, but others simply list names or choices for activities to use to reinforce a skill. Descriptions of these activities are listed on this page, but are also in a convenient 3 page printable version. The weekly planning sheets give you a few choices for teaching certain literacy concepts. This 3 page document describes in detail what is involved with each. 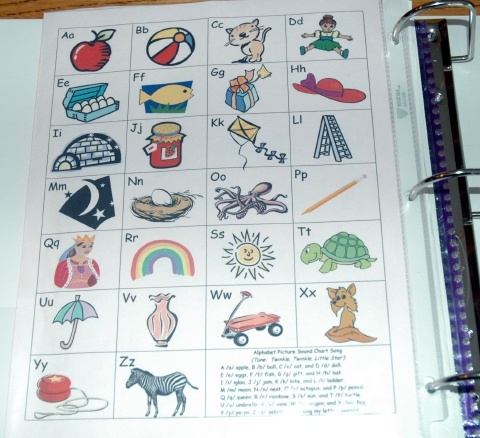 Phonemic Awareness activities are scheduled in to each weekly lesson plan. Your child will be splitting and counting syllables, blending onsets, rhymes, and phonemes. Word Family Mini Booklets - Read, cut apart, staple, and reread! Oddity Tasks - For example, show three pictures and ask the following questions... "Which pictures rhyme with bat?" "Which picture does not rhyme?" Hop For a Rhyme - Have your child stand, facing you. Orally say a set of words (sometimes saying two words that rhyme and sometimes not). When your child hears a word that rhymes, have him/her hop forward one time. If the words do not rhyme, have your child squat down. Riddle With Rhyme - Present your child with oral clues or riddles to solve using rhyming words. For example, "I am thinking of something that ____ that rhymes with ____. What is it?" Brainstorm Rhymes - Say a word and see how many words your child can say that rhyme with the given word! Maybe set a timer and see how quick they can do this. Repeat and see if they can beat their time. 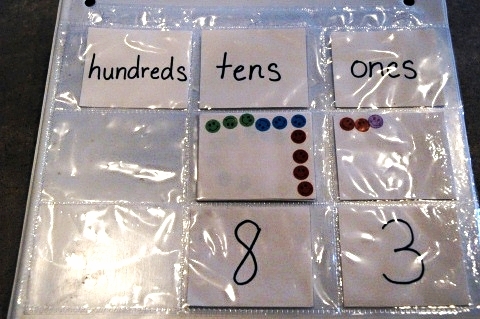 Rhyming Picture Sort - Give your child several pictures and have them sort into groups according to whether they rhyme. For example, give your child pictures that are in the -at, -an, and -ap word families to sort. Rhyming Memory - Match picture that rhyme. Rhyme Object Match Box - Find pairs of items that rhyme and place them in a box. Let your child match up the rhyming objects. Day 1: "Sing the letter song." There is a song to go along with each letter. This was learned in the 3's Bible and Rhyme Curriculum. There are flashcards you can print and/or larger song sheets that you can use. OR you may just wish to review the letter using flashcards you already own. Day 2: "Read ABC book or poem." The Sound Box books by Jane Belk Moncure are suggested, but feel free to read any books or poems that correspond to the letter you are focusing on. Day 3 choice: "Practice saying tongue twisters." For example, for the letter Ss, you might see how fast you and your child can say "Sally sells seashells at the seashore." Make it fun! Day 3 choice: "Create an Oral Story"
For example, for the letter Bb, you might say, "I'm going on a trip and I'm taking a bat, a ball, a book, etc. How many words can you and your child come up with that start with that sound? Day 3 choice: "Beginning Sound Hunt"
Look for objects that begin with a particular sound. How many can you find? Day 3 choice: "Oddity Task"
Show your child three pictures (two which start with the same sound and one that is different). Ask, "Which picture does not begin with the same sound?" Picture Sound Sort - Sort pictures into 2-4 groups according to beginning sounds. Picture Stamps - Match letters to beginning sounds of pictures on stamps or match the beginning sounds of pictures to other pictures. Worksheet - Circle or color pictures that only start with the focus sound. These are similar to the booklets that are published on the Sight Words printable booklet pages. I have republished many of them here, but there are also a few new booklets created just with the Joyful Heart Character character trait and/or science theme in mind. The Sight Word booklets are 8-10 pages in length and feature sight words or 'popcorn' words that cannot always be sounded out, but beginning readers need to readily know. The booklets have a predictable format - geared just right for emergent readers. For greater practice, the booklets build upon each other, with the later booklets repeating already introduced sight words. Try to find a special basket or box for your child to store these booklets in so that they will have their own special basket of 'I Can Read' books that they can read again and again! Cut Aparts are to be used with the corresponding sight word booklets. The first section of the Cut Aparts help students focus their attention to print details and reinforce the skills of matching text with one to one correspondence and differentiating between letters, words, and sentences. Once cut and rearranged, students will glue these into the booklets, under the appropriate text. 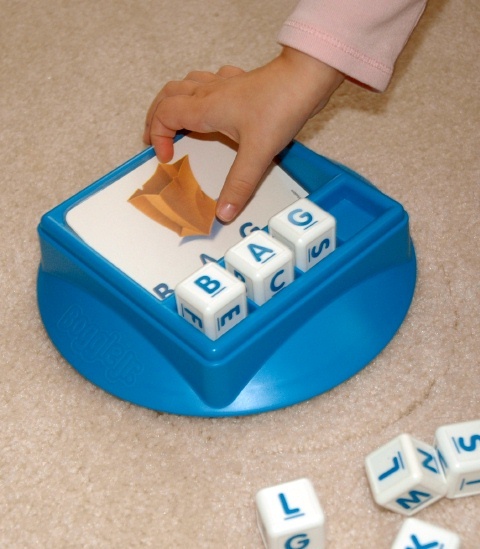 The bottom portion of the Cut Aparts, once cut, allows students to manipulate letters to form the sight words found within the sight word booklet. These letters can be stored in a small snack size ziplock to be reused or you may wish to have your child glue them onto the Sight Word Sheet and then practice writing the same word next to it. This is a large PDF containing 38 weeks worth of 'Cut Aparts, one corresponding to each of the Sight Word Booklets. Please be patient for it to open. This is a sheet for students to glue the cut apart letters and write the sight words from the story. Cut these word cards apart and use as is or attach to index cards and laminate for durability. 1) Introduce the booklet by showing your child the title page and talking about the picture, letters, and title. 2) Take a picture walk, one page at a time. Talk about each picture with the child. Use the same language pattern found in the story. See if your child points out any letters or words and make connections to the pictures. Introduce any new vocabulary. 3) Read the book to your child, pointing as they watch and listen. 4) Reread, having your child echo the sentences after you. OR Reread, pausing for your child to fill in a word based on the picture clues and letters. 5) Now, hand the book to your child and let him/her read and point! Monitor their reading as they do. Provide prompts as needed. For example, if your child pauses on a word, suggest that they try to sound out the first letter and then following letters and to look at the picture for clues. 6) After reading, ask your child what they did when they came to a word they did not know. 7) Ask your child to tell you what the booklet was about or ask them questions about what happened. 1) Reread the story, pointing to each of the words. 2) Choose a few words from the booklet to stretch out orally (/c/ /a/ /t/). Have your child guess what word you are saying. 3) Say a sentence from the booklet and have your child clap or move in some way for each word in the sentence. 4) Use the top portion of the Cut Aparts page. Read the sentence with your child. While he/she is watching, cut it apart into the separate words. Mix the words up and have your child glue it in the correct order under the corresponding text in the booklet. 2) Read the story again. This time, hunt for the sight words used in the story. Make the word(s) with one of the following: letter tiles, letter cards (from the bottom portion of the Cut Aparts page), foam letters, letter stamps, magnetic letters, etc. Then, have your child write the word using markers, a Magna Doodle, fingerpaint placed in a Ziplock freezer bag, dry erase boards, etc. 3) Reread the story one more time and then place it in the Book Basket. These are recommended games to purchase or borrow for your child. Using the "New CVC Words" listed on the weekly plan sheet, write one word at a time on a dry erase board, chalk board, or magna doodle. If you feel your child is ready, see if they can write some of the words as well. No pressure, just see what they can do! Create a special writing notebook for your child. Ours are made from stapling several sheets of printer paper. It has a title page on which the author writes his/her name and then several, double sided writing/drawing sheets that have a single line near the bottom of each page. Your child can draw on the top portion and kidwrite under the line. We date our page, draw, kidwrite, and then add smaller adult underwriting. A more thorough explanation can be seen on the Writing Notebooks and Writing Workshop pages. There are also related links. The following sheets were created with the goal of providing opportunity for both printing practice and sound discrimination practice. Model how to form the upper and lowercase letter for the particular letter you are focusing on. Then, say a word that either starts with that letter sound or does not begin with the same letter sound. If the word does start with the letter on the sheet, your child should trace one of the letters in the first two lines, using proper formation. If the word you state does not start with the letter on your child's page, then he/she should put their pencil down and look at you or some other movement to signal that they do not hear the focus sound at the beginning of the word. After the first two lines are filled in, have your child trace and free write the upper and lowercase letters in the boxes. Next, have them write 3-4 of each of the upper and lowercase letters on the blank line at the bottom of the page. You could use the sheets, as is, for purely printing practice, but the added sound discrimination practice is useful and builds in a way for your child to slow down and write more carefully instead of rushing to complete a page full of letters. Place only letters learned so far into a tub of rice, sand, beans, etc. Pre-make cards with CVC words to form with those letters. The child digs through the tub to find the letters in order on the card and places it on top of the letter. Read the word once completed. Variations: Follow the same procedure, but have sight words on the cards instead. Find a letter, say its name, sound, and brainstorm something that begins with that sound. Place index cards on the floor with various sight words or CVC words. Say a sight word and have your child use a fun shaped flyswatter to find and 'swat' the word! "Matching" –Have your child match rhyming pictures, beginning sound pictures, sight words, etc. "Uh Oh!" - Have a deck of cards containing the sight words you've introduced and a simple sentence underneath. Also add a decorated card with the words 'Uh Oh!!' on it. Show the top card and have your child read it. If they need help, read the sentence below it and ask them what would make sense and have those letters. If your child answers correctly, they get to keep that card (for the duration of the game). However, if they happen to get the 'Uh Oh!' card, they have to return all of their cards! Variations: Use letters and pictures with the letters/ beginning sounds you've introduced. I got the idea to use individual calendar binders from Kindergarten teacher Jessica Meacham's website. She provides photos and many free printables that make it quick and easy for you to make your own binders! Here is what is in our Joyful Heart Character Calendar Binder! Place Value Chart: We add one sticker for each day of school and then find the corresponding numeral card. We insert these into a 9 slot baseball card pocket holder. 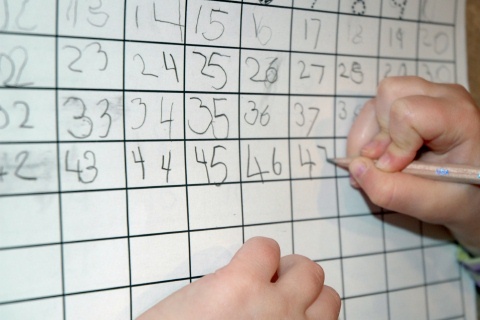 100's Chart: We point and count the numbers already written. Then, we write the next number in the box. Monthly Calendar: We count the days on the calendar so far, write the number needed for today's date, and say the full date with year. We also talk about the terms yesterday, today, and tomorrow. We also circle today's date with a certain color of pencil. As the month progresses, a pattern of circle colors develop and we say the colors used aloud. 12 Months: We point and sing the months of the year to the tune of 'Ten Little Indians'. Seven Days: We hold up our seven fingers and sing this to the tune of 'Are You Sleeping'. This Is the Day (Psalm 118:24): After talking about what day it is, we sing praise to God and are reminded of who made each day! Weather Graph (from Jessica Meacham's website): We look outside the window or think back to what it was like when we were outside earlier and mark what the weather is like on the graph. We then count and make comparisons of the types of weather we've had so far in the month. ABC Song Chart: We point and sing the letters of the alphabet to the tune of 'Twinkle Twinkle Little Star'. We pause slightly between each line and each space on the chart to make the tune fit correctly.The portion at the end which states, "And I Know that God loves me!" is from the My Father's World curriculum for kindergarten. I love this addition! ABC Sound Chart: We sing the sounds! With each new calendar month, determine a pattern that you want your child to focus on for the entire month. A sample of patterns is shown below, but you can choose whatever patterns your child needs additional help with. During the first few days of the month, before your child has discovered the pattern of colors, tell your child which colored pencil to use to circle the day of the month with. Throughout the month, after circling the date, touch and orally state the color pattern. Once your child has figured out the pattern, let him/her take the lead and find the correct color of pencil to use. The Joyful Heart Character Scope and Sequence Sheets show a breakdown of possible science / social studies themes for this curriculum. 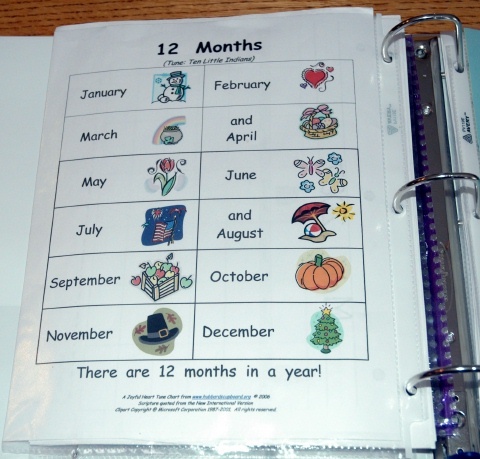 The themes correspond with the Sight Word Booklets and Story Books suggested for each week. Below are the different science / social studies themes. to get you and your little ones moving from Aa-Zz! Warm up and then have fun!